Noble Township was settled first by the Evans family who came in 1818. L.L. Allender, who had a ferry across Muddy River on the old "trace road," was also an early settler. James Broughton, Arvin Webster, William Elliott, Owen Coats and Lemuel Truitt were also early prominent citizens of the township. Lemuel Truitt came to Richland County in 1839 from Lawrence County, Illinois having come there in 1837. Truitt was from Maryland and was a progressive individual, although like many of the pioneers, he was uneducated. He soon became a businessman and a civic leader. The land in Noble and the surrounding land was originally deeded by President Fillmore to Lemuel Truitt in 1853. It has been established that Lemuel Truitt was the first settler to come out of the wooded area and across the prairie to live in what later became Noble. Noble was laid out in 1862 by Judge Alfred Kitchell of Olney and Mr. Truitt gave Judge Kitchell certain lots in Noble as payment. The village consisted of 20 blocks of 16 lots each, paralleling the railroad. Mr. Truitt donated the land to the village for the lots now used by some of the churches, the park and the recreational grounds west of the park. Prior to the platting, a Methodist Church had been built and at the time of incorporation in 1862 the population had grown to 600. Most of the early settlers of Noble were of Anglo-Saxon lineage and many came from Kentucky and Tennessee. The Patterson families came form Ireland, settled in Kentucky and then settled at Noble in 1867. The McDowell families were also natives of Northern Ireland, coming to Noble before the Civil War. In the late 1850s many settlers of Noble were well-to-do persons who came from New York, Pennsylvania and Ohio to make their homes. Many came on the train and they liked the location. There are several stories as to how the town got its name. One story is that a large number of settlers came from Noble County, Ohio. Another is that the first contractor to construct a part of the Ohio& Mississippi Railroad, running between Clay City and Noble, was Noble Irish. It was also reported that several families bearing that name lived near Noble. No doubt there are other versions, but none have been verified. Noble began as a large prairie. A two-story brick schoolhouse was built about 1865 in the south part of town. The Abbots, Taylors, Pattersons and McDowells first organized the Noble Christian Church in the Brushville School area many years ago. The church was eventually moved from the country to Noble where a lot was given by Hugh M. Sanderson. The church met for many years in the old frame building on Route 250 but in 1951 the beautiful new church was erected in the western part of the village. The Noble Methodist Church, built in 1865 on land deeded by Lemuel Truitt, was a frame building. This was used until 1985 when it was sold to the Glenwood Christian Church and moved to the site of the Glenwood Church where it was used for many years until the present block church was built. A red brick building was built by the Methodists in 1895 on the same lot. This Church was destroyed by fire in 1951 and was rebuilt and dedicated in 1953. The old Southern Baptist Church had a frame building located near the Noble Grade School. It was used until about 1918 when the congregation disbanded. The church was a member of the old Olney Baptist Association. Later the furnishings were removed and the old church was used as a basketball court for Noble School. The Church of Christ at Noble was established by families who came to Noble during the oil boom in the late thirties. 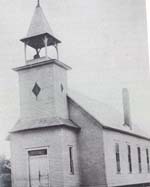 The old Brushville School was purchased and moved to the northeast part of the village and used for worship services for a period of time. In former years, Noble had four hotels: The Cottage Hotel operated by the Black family; the old Gertsch Hotel located on the north side of main street (this was said to be one of the oldest buildings in town); Hotel Hazel, a large frame building (later covered with brick), which was just north of the railroad on Noble Avenue; and Truitt's OK Hotel in the northwestern part of Noble. The first three were located near the railroad, very convenient for railroad workers, salesmen or other passengers arriving by train. The Hazel Hotel had an interesting History. It was first constructed as a two-story frame building about the turn of the century. In 1916 Sam Hazel Sr., the owner, had the building remodeled and a one-row brick exterior was added. Mr. Hazel's wife operated the hotel. Also in 1916, the Hazels built the Hotel Hazel in Olney, which is now known as the New Olney Hotel. The building was 30 by 75 feet in dimension and contained about 20 rooms. There was a large porch on the front. It was once considered one of the finest in southern Illinois. The Olney Daily Mail, March 25, 1959, reported that this old landmark had been destroyed by fire. It had not been used as a hotel for about 25 years, but had been occupied by various other businesses including a tavern, hospital nad restaurant at various times. For at least 15 years it had not been used and was becoming a hazard. 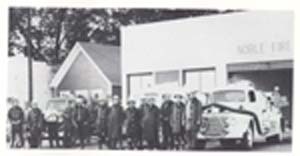 Fire departments from Noble and Olney worked to control the blaze and protect the nearby buildings: Bill Clark's service Station to the north and Ring's Appliance Store to the west. Noble also had three livery stables in the days of horses and buggies. A livery stable was operated by A. Foerster, better known as Foster, who also had a store in Noble. Levi Dickerson's stable was on the east side of Noble Avenue just south of the railroad. It later became a garage. Grant Black had a livery stable on the north side of Main Street across the street from the black Hotel and the old post office. This was later used in the oil field business. The Oil discovery in July 1937 by the Ohio Co. a mile northwest of Noble really placed Noble on the map. 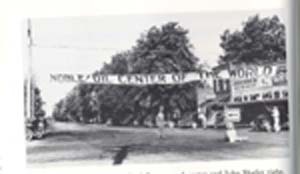 In the early days of the boom, Noble residents placed Noble a large sign over Route 50 in the village reading "Noble, The Oil Center of the World," in August 1937. The activity was so great that a campaign to drill oil wells on about every other block in Noble was begun. A great deal of the oil activity in Noble was in the Shafer addition in the north part of Noble. The discovery of oil in Noble was certainly a shot in the arm for the economy of that community. In 1931 both banks in Noble had closed their doors and economic conditions were difficult. The discovery of oil in 1937 brought renewed vigor to the economy. Many oil field workers from Kansas, Oklahoma and Texas came to Noble to work in the fields. The Marathon Oil Co., then known as the Ohio Oil Co., made the first discovery and then Pure Oil Co., began operations and made Noble quite a place for employment in the oil fields.